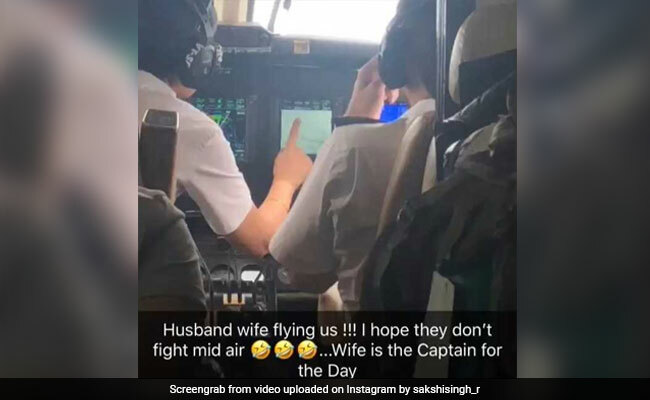 Sakshi Dhoni's has posted a video of the pilot-couple talking to each other while seated in the cockpit. Sakshi Dhoni has been sharing some wonderful updates from her holiday in Shimla and it appears the trip is now over. However, it's not post-holiday blues that seem to worry Sakshi - it looks like her big concern is being flown by two pilots who are married to each other. One of Sakshi's latest posts is a video of the pilot-couple talking to each other while seated in the cockpit. "Husband wife flying us! I hope they don't fight midair... Wife is the captain for the day," reads the caption on the video. The video is now collecting quite a few views and viewpoints from Instagrammers. While many find the video and Ms Dhoni's caption funny, there are some, like us, who are slightly offended by it. "This made me laugh too much," says one Instagram user, not unlike others. "No, not every wife and husband fight," says another. "Please give credit to the hard work of women yaar. She achieved this position through tremendous skill. I respect both husband and wife," says a third. There are also those who have serious questions about this arrangement. "It's against aviation protocol to have husband and wife fly the plane," reads a comment on Instagram. "How were you authorised to enter the cockpit?" reads another. It's this comment, however, that we think wins hands down. "Don't worry the cool helicopter is next to you," says an Instagrammer referring to Sakshi's better-half, former Indian cricket team captain MS Dhoni. Everyone knows Dhoni's helicopter shots are the stuff of legends. And even though we don't see Dhoni in the video - or in any other posts shared by Sakshi - we love this comment. Since being shared a about two hours ago, the post has collected over 1.2 lakh views and more than 37,000 'likes'. Tell us what you think of the post using the comments section.